We being a distinguished business company are highly dynamic in providing to the industry a vast gamut of Epoxy Flooring. Superdite® Epoxy Self Leveling Systems for EPI Electrical Pvt. Ltd., MIDC Mahape. FAB Flooring gives a wide range of flooring solutions. 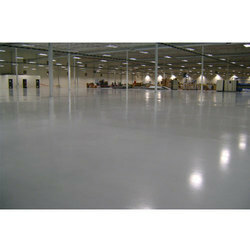 Excellent Epoxy Floors are engineered by us as per clients' specific requirements. We make sure to design the floors that are known for their efficiency, hygiene and durability. The floors are made available to the clients in different finishes.